To Robert Francis’s question about cedar waxwings, “Can you mistake us?”, for once the non-birder that I am answers: “No, I can’t.” However, based on a question/answer on the post you linked to, I might well mistake a a Bohemian waxwing for this familiar-from-Texas species if I found myself in New England. 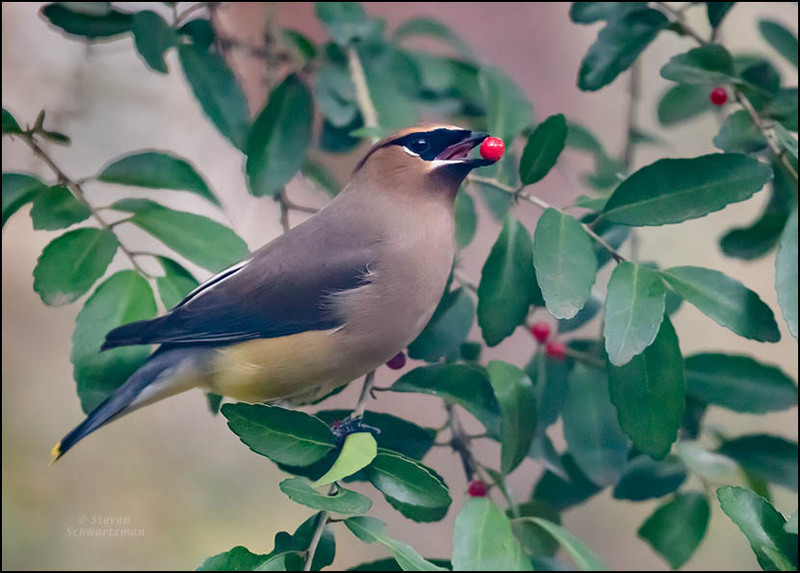 Also in that post I was surprised by that statement that the cedar waxwing is “one of the few North American birds that specializes in eating fruit.” I’d have thought lots of bird species specialize in eating fruit. I think the fruit-eaters tend to be more tropical. The live cams provided by the Cornell birding site include one in Panama that’s a fruit feeder. The number of species flocking to the bananas, papayas, and other fruits is remarkable. As for Francis, your comments here will jog your memory. Ah, how quickly one forgets—at least this one did this time. I’m not a jogger, so I’m happy to have my memory jogged. The crabapple trees here sometimes hold their fruit for a long time after it was ripe. They ferment. 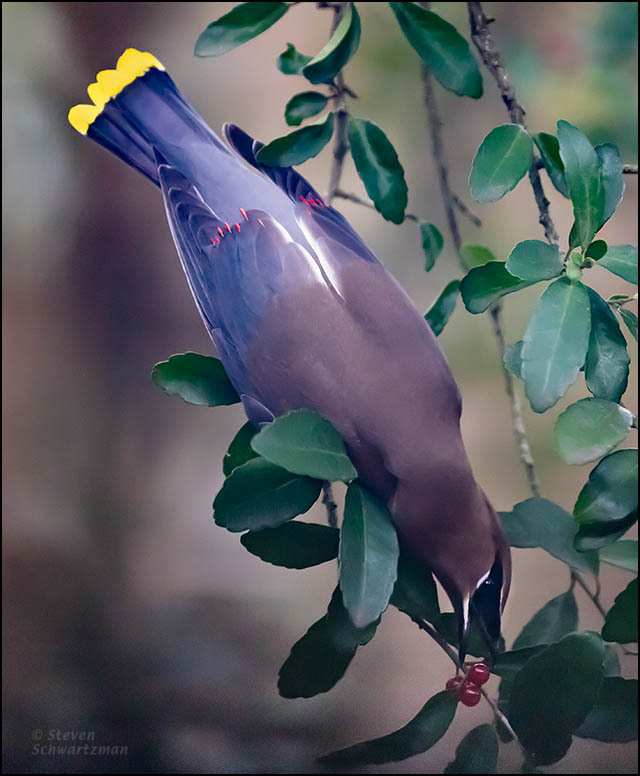 The Cedar Waxwings get intoxicated, interrupting their flight patterns. It’s kind of funny to watch. I seem to remember you mentioning that, and I’ve read about it in several places, including the link in Linda’s comment. The fruit of the yaupon doesn’t appear to ferment, so I’ve never seen any wobbly waxwings in my yard. I’ll take your word for it—what else can I do? I am experiencing the same bird sightings on this side of the state. I also made a post and it will be up by Monday. I have to say I had the same problems trying to photograph them and I am very much the amateur. They did provide an afternoon of great bird watching. I’ll look forward to your post. As you’ve said, watching cedar waxwings is fun but getting good photographs of the action isn’t easy, given how much and how quickly the birds move. One thing I did part of the time was to set the camera to take bursts of several pictures per second. Even then most of the pictures weren’t great, but in a few cases one of the pictures in the group caught a bird in a good position. If your camera allows for burst mode, you can try that. A photography class is one way to go, and you can find plenty of tips online. I haven’t seen a flock of waxwings feasting on berries for quite awhile, but it is a favorite memory. It was a treat to see, this morning here. Plus, I’ve been introduced to a new-to-me poet. And I was reintroduced to that poet, having forgotten the introduction three years ago. The waxwings are an annual occurrence here. Even if not witnessed, their feasting can be inferred from the sight of a yaupon or possumhaw full of fruit one day and completely bare the next. That’s for sure, you can always tell when they’ve passed through. I just went to a program last night about birding at Indiana Dunes. Evidently it is quite the place to see birds (by the thousands, in many species) because of the funneling effect of Lake Michigan. They are very pleased to have just won National Park designation. Yup, they are pretty pleased about it. I would fear the new designation would increase visitors to a point they would not be pleased, but evidently they already get huge amounts of people who come. The man leading the program the other night was very gracious about that~he spoke of getting as many people out as possible, to begin helping them connect to nature and to love it enough to want nature to be a priority. Does the designation as a national park bring extra funding? You’ve reminded me from the bit of reading I did at the time of our visit in 2016 that industrial companies destroyed part of the Indiana dunes a century ago. We can be thankful for the parts remaining in the state and national parks. We can indeed. I just went to a program yesterday about Moraine Hills State Park. I’m not sure I took you there. It is a preserve enclosing an area of glacial outwash~gravel and sand. The comment was made that if it hadn’t been preserved, it would now be a large gravel pit. You’re right that you didn’t take us there. When I looked at the map just now I noticed that adjacent to Moraine Hills State Park is Reliable Sand and Gravel. That proves your point. Ah, so it does. It is a beautiful park, but there isn’t much in the way to see botanically as far as I know, which is probably why we skipped it. Except, apparently, the plots that he studied there. They are very far off the trail and we’d need permission from the state biologist to go there. Your first shot would make an excellent greeting card. Agreed, and the red~green combination even suggests a Christmas card in particular. As for seeing the waxwings in action, perhaps you could find out what sort of fruit they eat in your area and then locating a source of that fruit to keep an eye on. I’m fortunate to have several yaupons in our yard and to know of two possumhaws a block away. I consider it a present each time I get to see and photograph these beauties. Thank you, Steve, they made me smile. I love these birds – but alas – I have only seen them in pictures – never in real life myself. Then let’s hope you see some in person soon, perhaps by traveling to a place where they’re common. What?! Who got close enough to see those red tips?! I don’t remember seeing the red tips during any of my previous times photographing cedar waxwings. Getting close to birds is usually a question of using a telephoto lens, which I did here. Those who named them so long ago did not likely use a telephoto lens. I suppose binoculars have been around for a long time. The earliest attestation of waxwing is 1817, so it could have been due to binoculars. It’s also the case that people kill birds or find dead birds and get a close look at them. Yeah, I was trying to avoid bringing that up. You know though, the tallest redwoods were measured after getting cut down. I guess the foresters didn’t know how to use trigonometry to figure out the heights of tall trees. When I taught trigonometry I used to send the students out to determine the height of a tall flagpole or something else they couldn’t measure directly. They were not foresters, but merely timber barons who hired scouts to find the biggest trees so that their crews could cut them down for bragging rights. Right near here, there is the carcass of a coastal redwood that was stripped of its bark, which was reassembled as an exhibit for one of the World’s Fairs. After being dismissed as a hoax, it was sent to a display in Washington D.C.
That’s an interesting story. It reminds me of how the platypus was originally thought by Europeans to be a hoax. Am wondering where waxwings are common. They are an occasional treat in the U.K. Not common here in Southern Spain either but we had our February bullfinch sighting. They don’t stay either but plucked a wild plum about to blossom for over 20 minutes. Just outside our kitchen window. has a distribution map that enlarges when clicked. The range shown there doesn’t include any of Spain but at the bottom of the map is this clarification: “All ranges are approximate, and many birds occur outside the main wintering range even in non-irruption years.” I’m afraid I didn’t turn up anything more specific for Spain. I’ll bet there’s a birding organization in Spain that could give you more specific information, or a Spanish language website. Mientras tanto, you’ve had your bullfinch sighting. Thanks Steve, will check too. Busy outside preparing for when the heat comes! Ah, heat. In Austin we’re at -1°C this morning, unusual for the first week in March. The sky is overcast and the trees are blowing back and forth in the wind. That’s not good for the blossoms that had emerged. Oh dear, such unpredictable patterns and extremes. I have to get any clearance and bonfires done before end of March. Used to be April but dry season can be longer or we will get torrential rain. Did you know that bonfire originally meant bone fire? I guess some people still make fires out of bones. Sounds gruesome. I always thought for no good reason it meant a ‘bonne’ or good fire! and I think you’ll be surprised. Well, blessings upon you then! The origin makes sense though and having to translate benedicere. Well said! And blessings upon etymology, which reveals so much. Thanks, Julie. It was a challenge but I got a few decent pictures.